A Short Drive to Hiking and Tubing at Deep Creek or the Smoky Mountain National Park and Historic sites. Pack a Picnic or Make Ice Cream in the Kitchen, Well Equipped for Preparing your Favorite Meals. Restaurants and Shopping are also nearby. 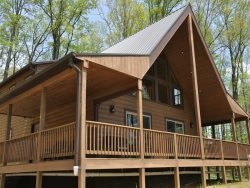 The Hilltop is a cozy mountain top cabin - warmly decorated and convenient to Harrahs Cherokee Casino and the Great Smoky Mountain National Park. 2 Bedrooms and 2.5 Baths: The first bedroom is an ensuite with a King bed with heated mattress pad. The second bedroom upstairs is also an ensuite with a Queen bed with heated mattress pad. In the Loft there is a twin daybed, which can be converted to a king at your request with the twin trundle. There is a half bath on the main floor. For reviews, please click on the Reviews Tab. A treasure in the mountains! I come up to Bryson City every year and going forward, I will be staying here. There wasn't anything, not one thing that wasn't beyond my expectations. Location, fireplace, kitchen fully stocked, all perfect! Hope to be back here next year! A good time was had by all and Lordy, lordy, Susan is 40 +30. A great Birthday weekend getaway for all! We enjoyed this cabin so much! The front porch is wonderful. The stocked kitchen was great. We loved feeding the birds and seeing all the Hummingbirds. We had a blast Mtn biking at Deep Creek. The train ride was scenic, just a cool experience overall. Rafted the Nantahala. Took a ride to Fontana Dam. Enjoyed the local restaurants and breweries. Thank you for the memories! A trip we won't forget. We were really please with the Hilltop! It has a beautiful view and everything was very neat and clean. the cabin exceeded our expectations! Members of the team were pleasant and helpful. Absolutely no issues, Great staff, knowledgeable, etc. Kathy was exceptional. I spoke to her several times during our stay. She gave us great restaurant recommendations and was quick to respond to questions. It was a joy to work with her and everyone at your company. The Hilltop is an amazing property. Although a little difficult to find, it was worth it. It was equipped with every possible gadget and appliance you could ever need. The landscaping, outdoor lighting, fire pit and overall appearance was exceptional. Interior was clean, tasteful and comfortable. We enjoyed our time on the porch in the rockers and roasting marshmallows at the fire pit. Had a wonderful week here. Everything we needed was available. We will be back next year. The dog is so sweet and we had coffee with him every morning. Thank you. Thank you for sharing your beautiful home with us. We were very pleased with everything in the house. It made us feel like we ere at a home away from home. The view was great. The cabin was wonderful, very nicely done, with fantastic view off the front porch. It was like visiting one of your friends whose house always looks just right, and extremely clean. Everything worked (which is not always the case) and easy to use. It's on the NC side of the park, a few minutes from Bryson City, and much quieter than Gatlinburg and the TN side. The only downside is the road up is a bit of a hill and it took concentration in 2 (front) wheel drive vehicle. It is difficult to find at night so I'd recommend to call ahead and have someone walk you through the written directions (seems like you're driving through someone else's backyard). Excellent stay. Beautiful property with great view. Very Clean . Thank you for sharing your beautiful cabin with us. It was wonderfully cozy and comfortable, with an amazing view. We had to remind ourselves to leave during the day! The hike out the back door was great! And even with the park closed there was so much to do. Thanks for a weekend away. How could time go by so quickly? Thank you for sharing your home with us. We were able to plan a quick trip on the way back from visiting friends. You have made us feel so comfortable and the coffee we enjoyed on the front porch will always be remembered. We will be back next year and hope to stay longer.